The categories of monitored credit report data are listed in the table above. Not all data related to these categories or your credit report is reported or monitored. Credit report data change alerts are available only for monitored credit report data, and may only be available if your credit report contains the minimum information required to calculate FICO® Scores. Monitored credit report data, monitored credit report data change alerts, and alert triggers, timing, and frequencies vary by credit bureau (Experian, Equifax, and TransUnion). Monitored credit report data is monitored once per day, and a credit report data change alert is provided for a detected change in monitored credit report data (excluding Sunday for TransUnion). myFICO does not control credit report data, which is reported by lenders and other companies to credit bureaus. There may be delay between the time of enrollment and the time credit report monitoring or a credit report data change alert is available, between an occurrence of a credit event (such as a balance change, account opening or change, collection activity, or newly listed public record) and the time credit report data is reported, and between the time credit report data is reported and detection of a change to monitored credit report data. Credit monitoring and alerts in certain locations, including locations outside of the United States, the District of Columbia and US Territories, may be limited or not available at all. A FICO® Score 8 is available, along with additional FICO® Score versions, for each credit bureau selected at the time you obtain a new credit report. In addition, an updated FICO® Score 8 is available at the time you receive a credit report data change alert for monitored credit report data (as described above), and at the time you receive a FICO® Score change alert (TransUnion or Equifax only). Updated FICO® Scores and FICO® Score alerts are only available if your credit report contains the minimum information required to calculate FICO® Scores. 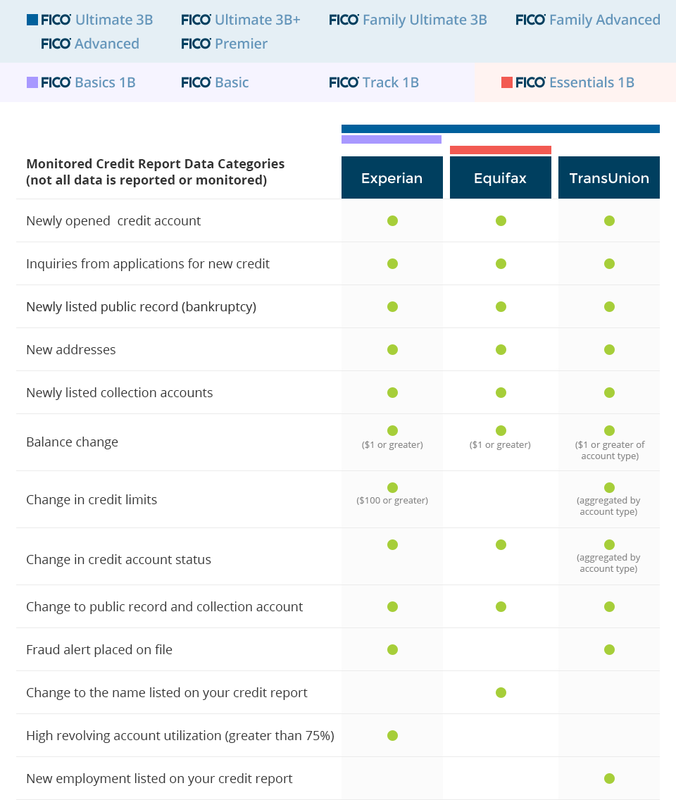 FICO® Score updates, monitoring, alerts, and alert triggers, timing, and frequencies vary by credit bureau. There may be delay between the time of enrollment and the time an updated FICO® Score, monitoring, or a FICO® Score alert is available. For TransUnion, FICO® Score 8 changes are monitored once per day, and a score change alert is provided for a detected FICO® Score 8 change only at the time you receive a credit report data change alert for monitored TransUnion credit report data (excluding Sunday). For Equifax, FICO® Score 8 changes are monitored only if you have not received a FICO® Score update in the prior 7 days, and a score change alert is provided for a detected FICO® Score 8 change. No other FICO® Score monitoring is available. FICO® Score alerts are only available for FICO® Score 8. FICO® Score updates, monitoring and alerts in certain locations, including locations outside of the United States, the District of Columbia and US Territories, may be limited or not available at all. *Alerts: You can elect to receive alerts via email or your wireless device. We support the following carriers: Alltel; AT&T Wireless; Cingular; Metrocall; MetroPCS; Nextel; Skytel; Sprint PCS; T-Mobile; US Cellular; Verizon Wireless; Virgin Mobile. Standard messaging and data rates apply. Other terms and restrictions may apply.